Southwest Airlines will move in LGA Sunday. LaGuardia Airport is the smallest of the three major airports in the New York area, with just two main runways. Planes often sit in long lines on the tarmac, waiting their turn to take off. So why would Southwest Airlines, a carrier that boasts about its on-time prowess, want to go there? In many ways, because it has to. Southwest prospered by offering low fares to leisure travelers whose only other affordable option was a car trip. It flew primarily to America's secondary airports where costs are low and productivity is high because incoming planes can land, drop off passengers, take on the next group and get back in the air quickly. On Sunday, Southwest starts service at LaGuardia, one of the nation's most congested airports. This should bring cheaper ticket prices to New York area vacationers flying to Chicago, Baltimore and beyond. But the move is also part of a risky transition that Southwest knows it has to make to win the loyalty of business travelers who increasingly will dictate its future prospects for success. Southwest started flying in 1971 with three planes. Herb Kelleher, the garrulous, chain-smoking co-founder, fought in court and in the air against bigger airlines that tried to run him out of business. Southwest didn't offer the amenities found on other airlines, but it outlived early rivals such as Braniff by sticking to a core philosophy: Give people low fares and great service. The Dallas-based carrier still sees itself as an underdog today, even as it serves 65 cities and carries more than 100 million U.S. passengers per year, more than any other airline. There are still no first-class cabins and no assigned seats on Southwest, giving it the air of a carrier for penny-pinching vacationers. "We're very dependent on business travelers, so we're not a leisure airline like some of our smaller competitors are," CEO Gary C. Kelly countered in an interview. He says company surveys show that in normal times at least 40 percent of his customers are traveling on business. Airlines covet business travelers because they make repeat trips and often pay higher fares for booking at the last minute. Southwest needs that revenue now. The Dallas-based airline has been profitable for 36 straight years but has been in the red since last fall. Traffic is down and costs are rising. While it's cutting flights across its system, Southwest is also entering New York and three other big cities, including Boston's Logan Airport. Robert Crandall, who competed against Kelleher when he ran American Airlines in the 1980s and '90s, said Southwest has stuck to a well-defined business model of low fares and low costs at secondary airports. "Going into LaGuardia is a change to that model," Crandall says, "but they've decided they don't have any choice -- they need the (passenger) volume to grow." 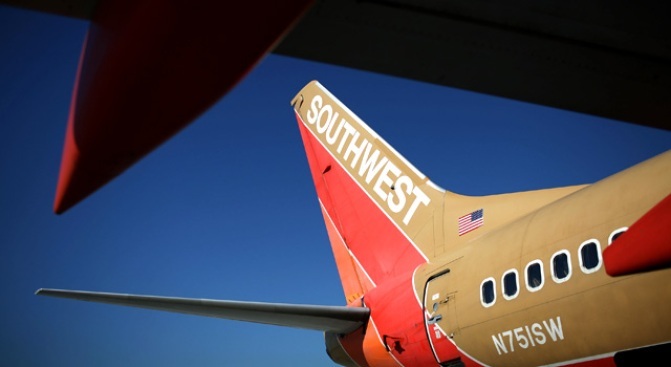 Kelly has been fine-tuning the Southwest model since becoming CEO in 2004. In pursuit of business travelers, he bent the traditional "first come, first serve" seating rules with "Business Select." Passengers pay a few bucks more to get a spot at the front of the boarding line, an extra frequent-flier award and a free drink. He also pushed Southwest into the kind of huge airports it once spurned. The strategy has worked in Denver and Philadelphia, where Southwest has grown rapidly. Now it needs the big Eastern cities to buttress its service at Chicago's Midway Airport, Southwest's second-busiest hub, with more than 200 daily flights. "If we're holding ourselves out to Chicagoans saying, 'We want to be your business airline,' we've got to be able to take them" to New York, Boston and Minneapolis, Kelly said. Southwest gained an opening at LaGuardia with the failure of a former partner airline, ATA. Southwest bought ATA's LaGuardia takeoff and landing slots out of bankruptcy in December. Despite the notorious delays in New York, Southwest officials believe they can turn around incoming planes in 30 minutes, close to its nationwide average. That's important because Southwest keeps costs down by getting the most use out of its planes -- on average, they make six flights and spend 12 hours in the air each day. Southwest will have to sacrifice a bit of its renowned thrift at LaGuardia. The airline says landing fees are more than double the average it pays at other airports. The New York-Chicago route pits Southwest against long-standing rivals American and United, which have many more daily flights between the two cities. Those rivals say they're ready. American CEO Gerard Arpey isn't surprised that Southwest has come to New York. He feels American can "compete very aggressively with anyone." Arpey's confidence may overlook some key Southwest advantages. Southwest's costs are nearly 20 percent lower than American's on a per-mile basis. Low costs, of course, let Southwest make a profit with lower fares. Southwest officials brag about forcing competitors to cut fares. In 1993, government analysts called this phenomenon "The Southwest Effect." Fare experts say Southwest still strongly influences ticket prices in markets it enters. Rick Seaney, chief executive of FareCompare.com, studied fares in Denver before and after Southwest returned to the market in January 2006. He said United, then the dominant carrier there, cut its average cheapest roundtrip fare out of Denver by one-third in the first year after Southwest said it would serve the same airport. United and American also trail Southwest in service rankings. While Southwest had the lowest rate of consumer complaints last year, American ranked 16th and United 18th out of the largest 19 airlines, according to government figures. Scott Tarbell, a printing-industry executive from Denver who was waiting for a flight at LaGuardia, says he makes frequent business trips to Boston and New York, usually on United. "I hate United," he says, "but I have to fly them because Southwest only goes to limited places." As it goes after new passengers, Southwest faces its stiffest challenge since the early days in Texas. Volatile fuel prices and the recession have hurt Kelly's attempt to raise annual revenue by $1.5 billion. "It's just been a very long, difficult decade with one economic challenge after another." Southwest "should be profitable" this year barring any more surprises, he said, then had second thoughts. "In this environment," Kelly added, "I'm not going to make any bold predictions."